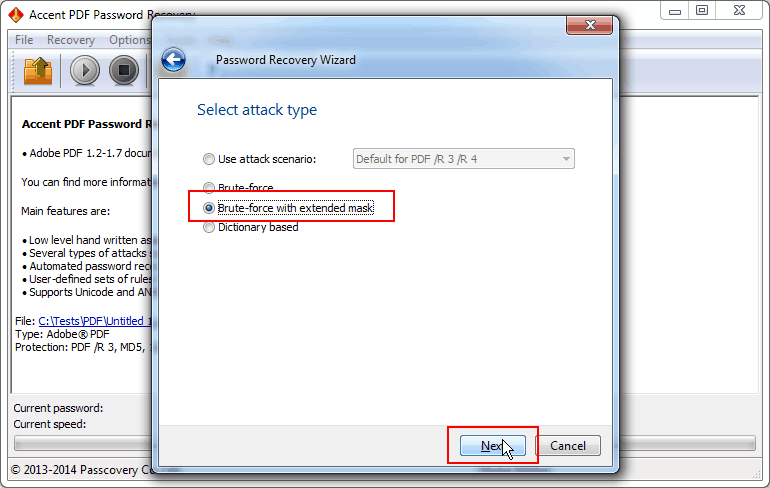 Successful recovery of a strong password is determined by the high speed of attack and effective management of range settings. Passcovery programs with finely tuned speed parameters show excellent results both on CPU and NVIDIA/AMD graphics cards. Try them out! The demo versions with no speed limitation are available at no charge. Extended (positional) mask attack is a flexible and powerful tool that enables to cut down on unnecessary checks. The option allows you to define a range of characters to be used in each position of the password when it is generated, and omit the unnecessary ones. That helps reduce the number of possible combinations and saves time. 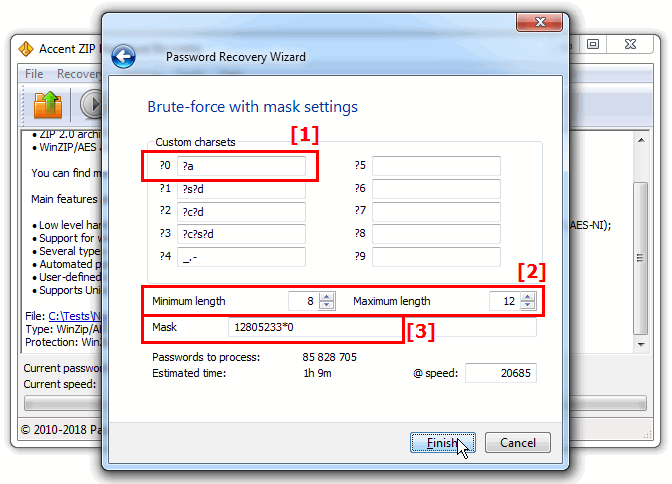 If you are recovering a strong protection password and you know something about its structure then «Brute-force with extended mask» would be the perfect method to use. Review the examples to see how it works and what it’s all about. The extended mask option is available in all Passcovery programs. 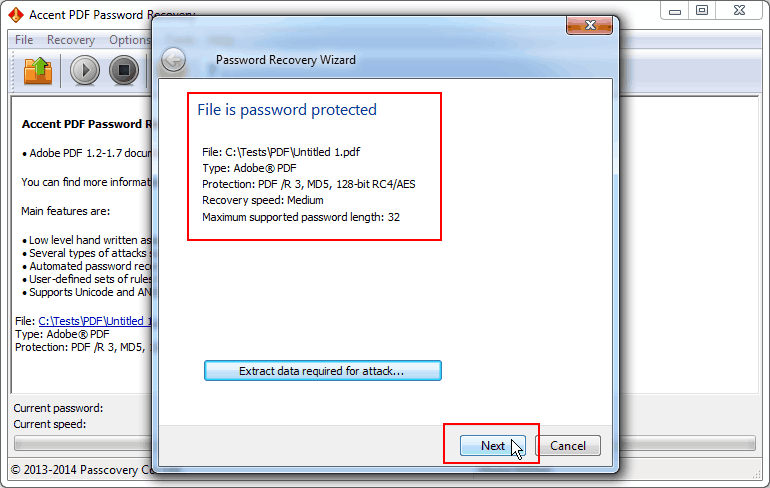 The examples below illustrate the use of AccentPPR as a password cracker for all versions of Adobe PDF; the same scenarios can be fulfilled using any other Passcovery program. 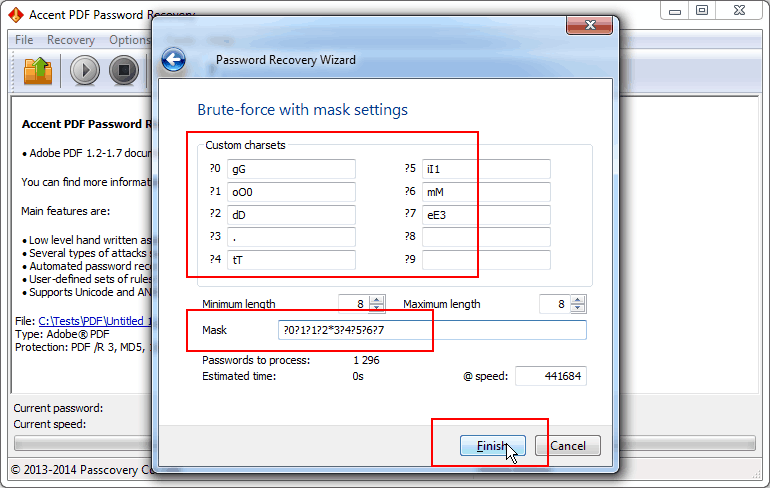 To customize the password generation process you can specify up to 10 sets of characters for each position of the mask. A mask is defined using simple prefixes. You can limit the length of your mask if necessary. Find more details in the help file. The first and last position of the password will be a capital letter and a digit respectively. 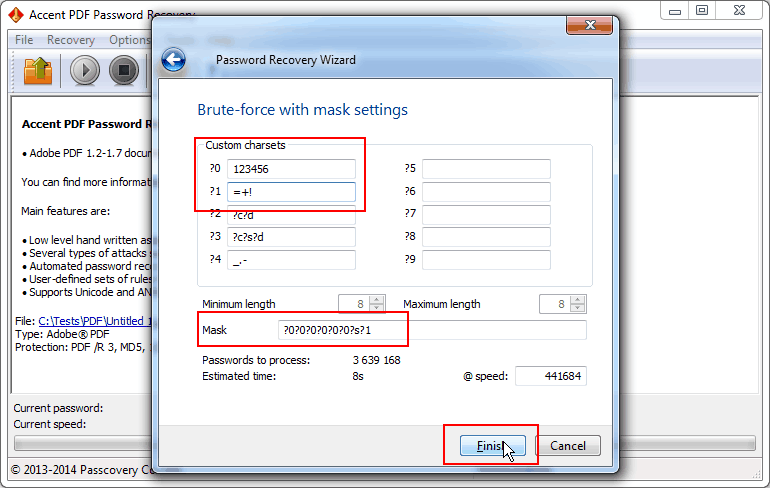 The prefix *(asterisk) will tell the program to use the characters from the #0 set (those are uppercase and lowercase letters shown in the screenshot) for all other positions in the password. The number of positions will vary based on the varying length of the password. 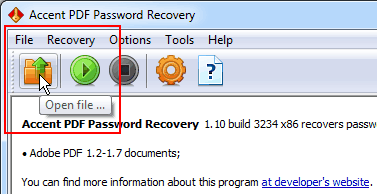 First goes the known part of your password (12805233). Then you describe the unknown part using the charset “?0”, which denotes all printable characters — macro “?a”. By setting the minimum and maximum length you define the number of characters in the end part of your password within the specified range. We offer a universal all-in-one solution for a large number of popular formats and a dedicated line of programs for specific file formats. All the programs have a unified interface featuring the same finely tuned speed parameters. Our solutions offer acceleration on AMD/NVIDIA GPUs. Trial editions for Windows x32/x64 are available for download. Should you have any problem setting an extended mask please feel free to contact our helpdesk. We will help you and add an example to this page based on your case. My password is 8-10 characters long. It starts with a capital letter and ends with a number. 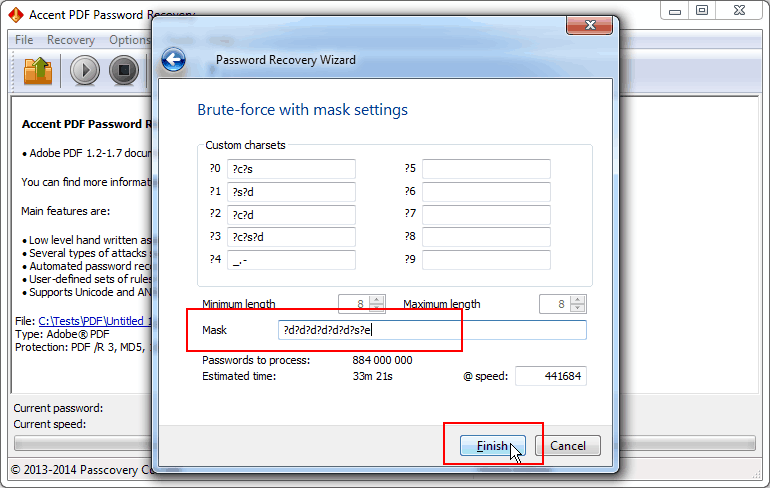 How do I set these conditions to crack the password using your software?